Payment is due when services rendered unless other arrangements are made in advance. We offer a wide range of easy, flexible payment options to our clients. We accept Cash, Personal Check, and Credit Cards (Master Card, Visa, Discover, and American Express) as well as offer Care Credit (3rd party financing - 12 month's no interest). New patients: As a new patient, you'll receive a "full mouth series" and a panoramic radiograph of the entire head and neck. This is standard as part of our comprehensive exam. We do complete x-rays during your initial exam because we like to evaluate each individual tooth and how each tooth functions together, along with checking for any other pathology that may be found. After your initial comprehensive exam, you'll receive 2 or 4 bite wing x-rays once a year and a new panoramic radiograph every 3 - 5 years which is in accordance with the standard of care established by the state of Georgia's Board of Dentistry. What happens at a child's first appointment? The plans for children vary depending on the age of the child: for 1 - 2 year old's, we try to introduce them to the dentist office and teach them about the different tools that are used at the dentist office. We do our best to do as much as each individual child feels comfortable allowing us to do. We want this first visit to be a positive experience and try to make it fun for the child. For children of all ages, we'll teach them about the tools that we use during our procedures and talk with the parents as well. Some of the things you'll learn about are proper oral hygiene techniques. Treatments that the child will receive consists of teeth cleaning and fluoride treatments and a check by Dr. Frazier, this way the child is introduced to the dentist office gradually. 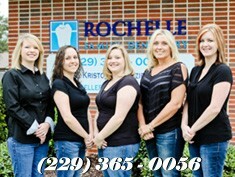 Our desire here at Rochelle Family Dentistry is to make the child's first visit to our office a pleasant and enjoyable experience and hopefully make them excited about coming back. "Cavities" is another way of saying tooth decay. Tooth decay is heavily influenced by lifestyle, what we eat, how well we take care of our teeth, the presence of fluoride in our water and toothpaste. Heredity also plays a role in how susceptible your teeth may be to decay. One of the best ways anyone - young or old - can prevent cavities is by brushing and flossing their teeth on a regular and consistent basis. Proper brushing is all about 'technique'! And in order to properly brush you teeth, you must take at least 2 minutes to do so. Most adults do not come close to brushing that long. To get a feel for the time involved, try using a stopwatch. To properly brush your teeth, use short, gentle strokes, paying extra attention to the gumline, hard-to-reach back teeth and areas around fillings, crowns or other restoration. Flossing is probably one of the most under-utilized dental health techniques used by patients, yet provides the most benefits to the overall health of your teeth. Proper flossing removes plaque and food particles in places where a toothbrush cannot easily reach such as under the gumline and between your teeth. Because plaque build-up can lead to tooth decay and gum disease, daily flossing is highly recommended. Proper flossing techniques include using dental floss and following the natural flow and structure of your teeth. Sealants: What they are? What do they do? Dental sealants are a special coating that is placed over your teeth, typically on the chewing (or back) teeth, in order to help prevent tooth decay. Because people naturally chew with their back teeth, they are susceptible to decay and long term problems. Sealants help to protect these teeth from decay, and preserve the natural enamel that is covering your teeth. Gum Disease: What it is? How it's caused? Gum disease - or sometimes called 'Periodontal disease' or 'Gingivitis - affects nearly 80% of all adults in the United States. Periodontal disease can range anywhere from mild gum inflammation to serious cases of disease that is causing damage to gum tissue that ultimately results in tooth loss. How to prevent gum disease: Preventing gum disease is really a simple process, but requires consistency and habit of some very basic practices like brushing your teeth at least twice a day, flossing your teeth regularly, and visiting Rochelle Family Dentistry at least twice a year for regular checkups, cleanings, and preventative dental care. When patients are missing teeth, they are usually always trying to learn about what options they have to replacing those missing teeth. Regardless of whether someone is missing a whole mouthful of teeth, or just one tooth, Rochelle Family Dentistry would love to sit down and discuss the many options that you have available. To ensure your comfort and safety after tooth extractions, please follow these at-home guidelines, and be sure to call if you have questions or concerns. Following extractions, some bleeding is to be expected. Blood in the saliva is likely for the first few days. Initially, bite down and apply pressure on the gauze for 1 hour. At the end of one hour, replace the first piece of gauze with a piece of gauze that has been dampened and the excess water squeezed out. At the end of the 2nd hour, remove the gauze. If bleeding should resume, put a fresh piece of gauze over the socket and bite down on it with a firm pressure. To minimize swelling and pain, chopped ice wrapped in a towel should be applied to the operated area: one-half hour on and one-half hour off for 4-5 hours For the first 24 hours: 	NO Smoking 	NO Sucking on straws, either spoon or drink liquids, such as milk shakes 	NO Hot liquids (i.e. Hot coffee, tea, or soup); cool or room temperature liquids are OK. A liquid or soft diet is advised during the first 24 hours and drink plenty of liquids. 	NO Carbonated soft drinks; but ice tea is OK 	NO Alcoholic beverages 	NO Aspirin or aspirin-containing pain medications, unless prescribed by your dentist (Tylenol or other non-aspirin pain relievers are acceptable if needed for pain) 	NO Spitting. If you need to remove something from your mouth, use either a paper towel or open your mouth over a sink or basin and let any blood-tinged saliva drop freely from your mouth into the sink. 	DON”T Blow your nose forcefully 	NO Strenuous work or vigorous physical activity for the remainder of the day 	NO Rinsing after the extraction until the next morning to avoid dislodging the clot. Then do a gentle tongue rinse with warm salt water (1/2 teaspoon salt to an 8 oz. glass of water) to clean and freshen your mouth, not to clean out the socket and risk dislodging the newly formed clot. After rinsing with warm salt water, lean over a sink and allow the water in your mouth to drop out into the sink. Then, do a gentle tongue rinse with plain tap water to wash the salty taste away and allow the water to drop into the sink. Wipe your mouth off with a washcloth or paper towel – but DO NOT SPIT! 	Small sharp bone fragments may work up through the gums during healing. These are not roots. If annoying, return to this office for their simple removal. 	If any unusual symptoms occur, call the office at once. What labs do you use? We use the following labs: Georgia Dental Lab in Tucker, GA, Glidewell Labs in California, Ricky Thorton Dental Lab in Cochran. Oral Surgery, Sedation and Third Molar Surgery : Dr. Vincent Carey in Warner Robins, Dr. John D. Roan in Tifton, and Dr. Roger Myers in Douglas. Endodontics: Dr. Michael Doyle in Warner Robins. Orthodontics: Dr. Dana Fender & Dr. Greg Goggans in Tifton, and Dr. Don Spillers in Warner Robins. Periodontics and Implants: Dr. Russell Eyman and Dr. Vin Bhasin in Warner Robins.